We're delighted to confirm that the 2018 York Rally will be taking place on the weekend of 23-24th June 2018! Campsite bookings are open now - book your pitch ASAP to enjoy the much-reduced super-earlybird prices, to be sited with your friends or clubmates, and to help support our planning! This will be the fourth edition of the Rally run by the new all-volunteer team which revived the Rally in 2015 - huge thanks to all who have helped and supported this effort. We're happy to report that the 2017 event was another safe and successful Rally! It was a good year for rides, racing (BSCA and cyclo-cross are both keen to come back in 2018) and talks (speakers including Chris Juden, Mark Waters, and the Biking Bishop of Selby), with the tent often packed out. Sadly two bikes were stolen overnight despite the security presence, although happily Graham Lawrance's beloved Bob Jackson has since been safely recovered. Financially, a significant dip in trade bookings was behind a small loss over the year, although this was safely covered by Rally reserves and fundraising efforts including the 2017 Sportive. So for 2018, we need to work even harder to ensure that future Rallies are both succcessful and profitable - without making camping unaffordable, or compromising the open nature of the event by charging for entry. As you'll see in the coming months, we're now working to bring in fundraising and sponsorship to help secure the Rally's future. We hope this will allow us to offer even more facilities and activities to all who attend the Rally and, we hope, attract ever more younger-generation participants. We'll do this while carefully safeguarding the Rally's unique, non-commercial character and all-volunteer ethos. The first stage of this is a crowdfunding campaign on JustGiving - please do chip in if you can to support your Rally! We'll keep everyone posted as plans develop, but for now, please do make sure you can make it to the Rally on the 23-24th June 2018 - and book your campsite pitch now! Last edited by bikepete on 5 Apr 2018, 7:57am, edited 2 times in total. Vote for York Rally to receive money from the Aviva Community Fund. Thanks Gaz, beat me to it. where you can give us up to ten votes (the more the better!). You may have to register first if you haven't previously voted on the Aviva site. Many thanks in advance - let's hope we win! Last edited by bikepete on 5 Apr 2018, 7:56am, edited 1 time in total. Perhaps a mini tour could be added to the Rally, start at York railway station on the Monday morning. Monday - Thursday camping at various locations and arrive back in York for Friday. Assuming cycle camping. People could have 6 days of rides, including the Saturday rides from the Rally. A suggested route sheet could be provided. It could be a mini tour for after the Rally if this suited more people, leaving on the Monday morning. This would allow for details to be displayed at the Rally and people join if they wish. May be worth a try for one or the other option. A mini tour before or after the Rally sounds like a great idea - and definitely something the Rally would support and publicise. A volunteer would just need to step forward to organise it... any takers? 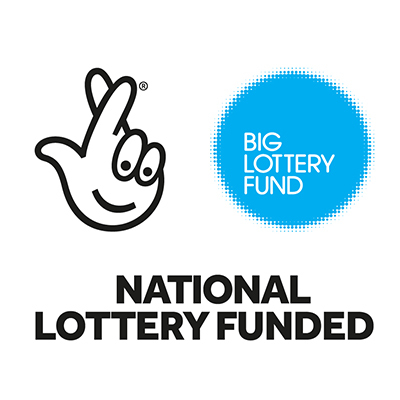 I'll also mention it at our next planning meeting (and AGM), which is on the 25th November 2017 at 10AM at the Church Hall of St Chad’s on the Knavesmire, Campleshon Road, York YO23 1EY. Please just let us know if you would like a lift from the railway station. As ever, all are welcome, especially with new ideas like this! I will try to attend and offer to lead or help with the first mini tour. Hopefully a few others may be available to provide back up, gain experience if needed and enjoy the ride at the same time. Forget the winter cold - look forward instead to a convivial summer on the York Rally campsite! And what better present could you give, to yourself or someone special, than a classic weekend of camping and cycling? Book your pitch by the end of the year to enjoy the lowest possible "super-earlybird" prices, and we can site you with your friends or club-mates, too! 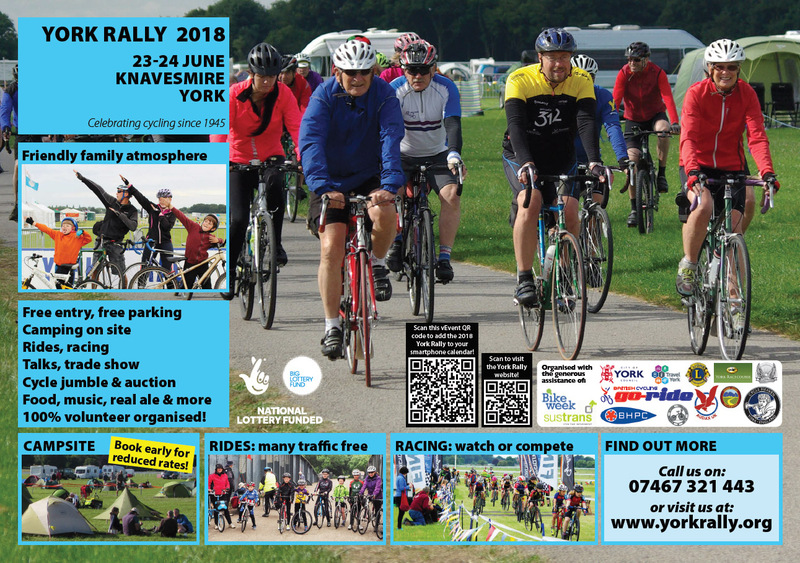 Entries are invited for the York Rally Sportive 2018, our fourth York Rally fundraising Sportive! 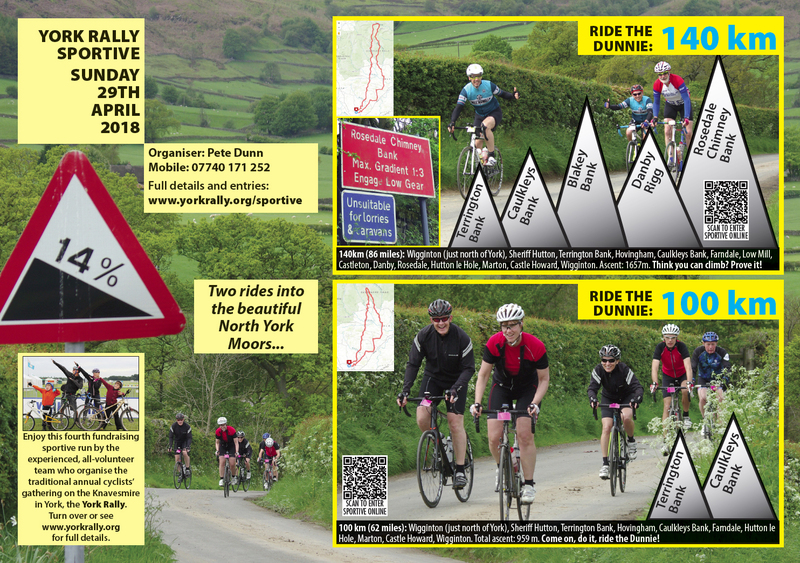 Our experienced all-volunteer team are looking forward to welcoming riders once again for a superb day of riding on a classic route into the North York Moors, starting from Wigginton on the northern outskirts of York. You can enter online or by post via British Cycling: https://www.britishcycling.org.uk/events/details/168077/York-Rally-Sportive and if spaces remain, there'll also be entry on the day too. Apologies - bit of a gap since the last update! So it's time for an eight-point Rally update! 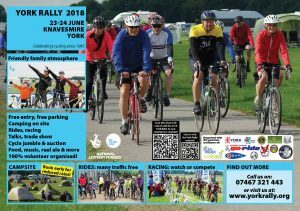 The next York Rally is coming up fast on the 23-24th June 2018 – and even sooner is our fundraising Sportive, on Sunday the 29th April. Last call for the Sportive! We can always use more riders, and a few more volunteers would also be great! To sign up to ride, visit the Sportive web page, and if you’re free on that Sunday to volunteer, at HQ in Haxby or out on the course, please call organiser Pete Dunn on 07740 171 252. All funds raised go to support the Rally! Are the children's helmets fitted correctly? Helmets are compulsory for the racing events at the Rally (not our rules), otherwise they are definitely not compulsory. Other information may be published shortly and I think would be of interest to cyclists.